Want to cut up to 15 sheets of paper at a time? With the Carl heavy duty rotary trimmers, you can trim up to 15 sheets at a time as well as mat board, card stock or plastic sheets. The trimmer has a sturdy metal base that is calibrated and features preset Product number CUI72215. I purchased this reluctantly as it is a replacement for a 15" Carl Trimmer that I have had for over 12 years. It was well used and well loved but needed to go. I was not able to find the exact model (it is no longer made) and after several conversations with the manufacturer, I decided to go for the new one. Binding offered the best price - nearly 1/2 off the cost retail. I am happy with all aspects of this new trimmer. Highly recommend it. Will this cutter cut heavy chipboard? Thank you for your question. 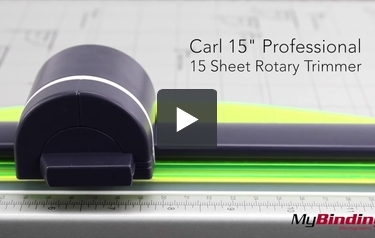 The Carl 15" Professional 15 Sheet Rotary Trimmer would be able to cut chipboard up to approx 24 pt but it would not be able to cut book board. Can it cut chip board? Thank you for your question. This could cut thinner chip board, but we would not recommend this with anything thicker than an 18 - 20pt, and most likely 1 sheet at a time. could i use this trimmer to cut finished 10 mil laminate? This unit should have no trouble cutting 10 mil laminate.